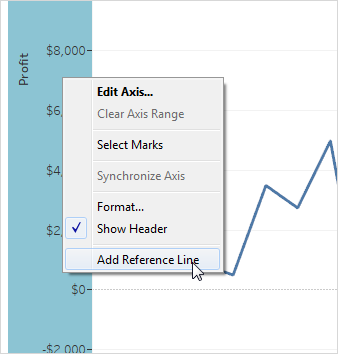 In the Add Reference Line, Band, or Box dialog box, select Box Plot. Data within 1.5 times the IQR - places whiskers at a location that is 1.5 times the interquartile range—that is, 1.5 times further out than the width of the adjoining box. This is also known as a schematic box plot. Maximum extent of the data - places whiskers at the farthest data point (mark) in the distribution. This is also known as a skeletal box plot. Specify whether to Hide underlying marks (except outliers)—that is, whether to hide all marks except those beyond the whiskers. 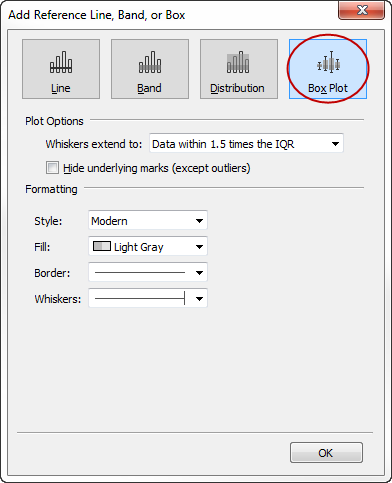 Configure the appearance of the plot by selecting a Style , Fill, Border, and Whiskers.